Sell a vehicle to a buyer with this USA Bill of Sale form. 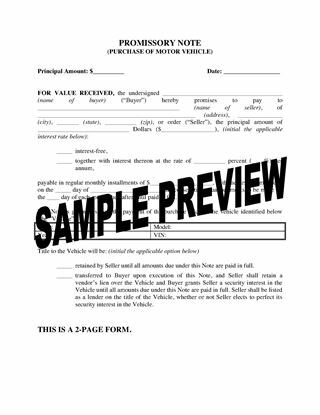 This form can be used to sell a car, truck, SUV, minivan, pick-up or other vehicle except for a boat and/or boat motor. The seller represents to the buyer that he/she is the legal owner of the vehicle and has the right to sell it. The seller also represents that there are no encumbrances, liens or security interests registered against the vehicle (except for any that the buyer has agreed to assume). The form includes the seller's certification of the odometer reading required by U.S. federal law. The buyer will need the Bill of Sale to transfer ownership of the vehicle. Download this form, fill it in, and sign it to complete the deal. Georgia lenders can use this template Deed and Promissory Note to secure repayment of a debt from a borrower. The Deed and Promissory Note are typically used as security for a mortgage loan in the State of Georgia. The borrower conveys title to the property to the lender until the full amount of the indebtedness plus interest is paid in full. Once the debt is paid, the lender will reconvey the property to the borrower. The lender has the option to declare the whole amount due and payable if the borrower sells the property, or defaults under the loan. The lender has the power to sell the property if the loan is not paid by the maturity date. The downloadable file includes a Promissory Note. To get your copy, purchase and download the form. You can personalize it with the details of the borrower and print it for signing. Place your vehicle temporarily in the care of another person with this template Vehicle Bailment Agreement. You need a Bailment Agreement for situations where your vehicle is in someone else's possession for a short period, for instance if you loan it to someone or they're storing a vehicle for you. The bailee (person who has possession of the vehicle) is responsible for looking after the vehicle and returning it in the same condition as when it was bailed. The bailee indemnifies the vehicle owner against all liability arising when the bailee had possession of the vehicle. The owner may terminate the agreement prior to its expiry for any misuse or neglect of the vehicle by the bailee. This Vehicle Bailment Agreement is a generic legal form template that is not country-specific and can be used almost anywhere. Don't sell a vehicle to a buyer with the price to be paid over time unless you get them to sign this Promissory Note for Vehicle Purchase. This form is for vehicle sales in the United States only. The Promissory Note includes two interest clauses, one for annual interest at a specified rate and one for no interest. Use the one that best fits your situation. If the title is transferred to the buyer, the seller has a lien on the vehicle until the balance is paid in full. The buyer can prepay the outstanding balance at any time without paying a penalty. The seller can repossess the vehicle if the buyer fails to make the payments on time. A promissory note is security for repayment of the amount owed. This USA Promissory Note for Vehicle Purchase is a downloadable legal form that you can customize to fit your transaction. If a buyer gives you a deposit before buying a vehicle from you, issue them a receipt with this easy-to-use template form. 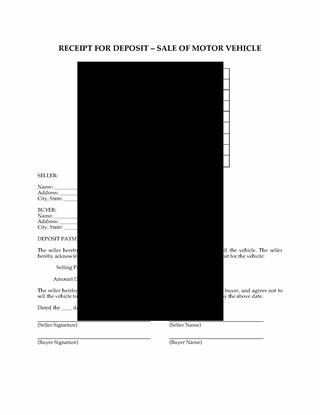 This receipt form is only for motor vehicle sales in the United States. The receipt contains the identifying information about the vehicle (VIN, title number and odometer reading). The form also sets out the amount of the deposit and the amount of the balancing still owing for the purchase of the vehicle. The USA Receipt for Deposit in Sale of Motor Vehicle form is easy to use. Just print it, fill it in, and sign it. Lease your vehicle to another person with this downloadable Vehicle Rental Contract for a private vehicle. This agreement is only for private rentals, not for car leasing companies. Under this contract, you can lease your vehicle by the day, week or month. The renter is responsible for safe and lawful operation of vehicle at all times. No secondary drivers are allowed unless first approved by the vehicle owner. The renter indemnifies the owner for any damage to or by the vehicle except if the damage is due to a problem with the vehicle not caused by the renter. The refundable deposit will be applied to repairs if necessary. The renter must pay the cost of all gas and fluids during the term of the contract. This is a generic legal contract which is not specific to any state, province or country. 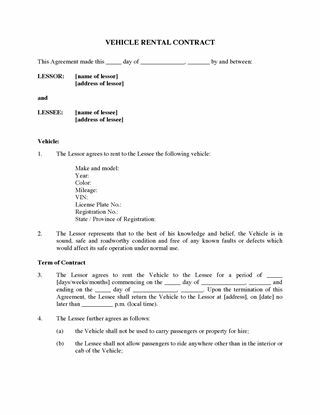 The Vehicle Rental Contract template is so easy to use - buy, download, fill in and print for signature.